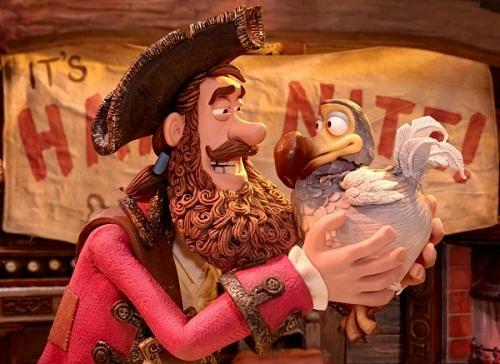 In this stop-motion animated feature the Pirate Captain (voiced by Hugh Grant) is preparing to enter himself into the Pirate of the Year competition. Having failed over a number of years to take the prize, he is laughed off by his competitors including Cutlass Liz (Salma Hayek). Supported by his crew including Number Two (Martin Freeman), the Pirate Captain sets off to plunder as much treasure as possible and become a serious contender for the top prize. When he and his men aboard a ship they stumble upon scientist Charles Darwin (David Tennant). He only has animals and body parts so to save himself he tells them that the parrot Polly they are carrying is the last living dodo and convinces them to attend a science show where they will collect a prize. Number Two remains suspicious of Darwin and his trained monkey who is trying to sneak off with Polly. 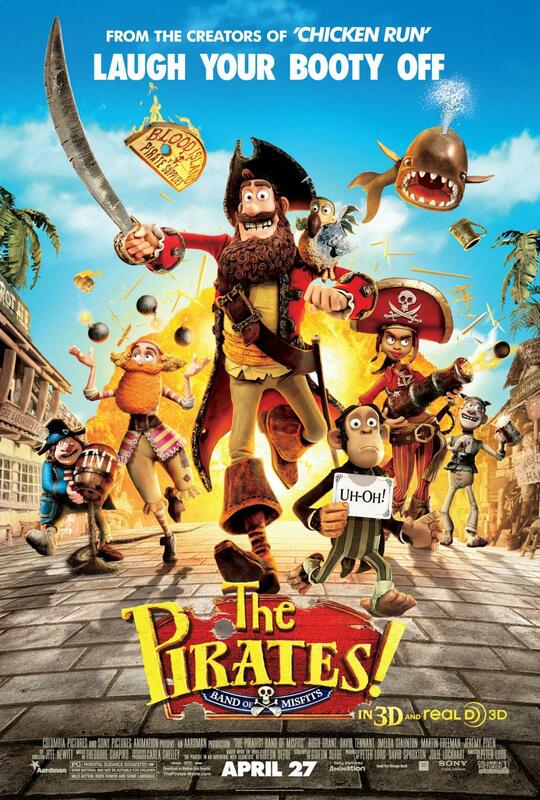 The group is also pursued by Queen Victoria (Imelda Staunton) who is intent on hunting down all pirates. The Pirates! Band of Misfits is regularly funny and colourfully written, but not everything I had hoped for. The film carries great expectations given the success of Peter Lord's previous film Chicken Run (2000) and his work as a producer on the animated shorts Wallace and Gromit. Due to the film's frequently witty screenplay, Lord and co-director Jeff Newitt make the intelligent decision of focussing on humour instead of action. The film is modest, never reaching the spectacle of How to Train Your Dragon (2010) or the emotional peaks of Up (2009), but there is fun to be had both visually and aurally through the script's wordplay and sight gags too. I am always astounded by the minute details that animators impose on a single frame or image. In one of the film's silliest moments the Pirate Captain's crew ride a bathtub down a flight of stairs and if you look closely you can see one of the men rowing with a paddle. This brand of ridiculous humour is complimented by an enthusiastic and well-chosen set of voice actors. The leads are outstanding. Who better to play a know-it-all, self-absorbed dummy than Hugh Grant? He's well serviced by funny, blink and you'll miss it dialogue like: "We didn't evolve from slugs to stand around!" By his side is the sensible, reassuring voice of Martin Freeman, who rather cleverly brings the same sense of maturity and reasoning as his interpretation of Watson from the TV series Sherlock. Some of the other actors voicing the side characters are underused, including Salma Hayek, and just seem to be included for a name on the poster. In terms of narrative The Pirates! has a few turns and gimmicks that separate it from the usual coming of age animated stable. How many animated features would be willing to include the likes of Charles Darwin? Or references to Jane Austen? There's a nice mixture of silliness and more sophisticated jokes for adults here. It's disappointing that the story lets itself down in the final quarter because the gears of the narrative grind to the sound of predictability. No matter how clever the jokes are there's an air of familiarity about the story arc and the situations towards the end. Also worth noting is that the film is in 3D but the stop-motion animation is finely detailed on its own, meaning that the extra dimension seems unnecessary and mostly superfluous. Overall, the film is a pleasant and harmless distraction but it reiterates that there is still a sizeable gap in the mainstream animated circuit between what is light, funny and charming and the more involving, multidimensional works from the likes of Pixar.